What defines an abrasive leader? Abrasive leaders rub their co-workers the wrong way. Their words and actions create interpersonal friction that grates on subordinates, peers, and even superiors, eroding employee motivation and organizational productivity. Abrasive conduct can range on a continuum from mildly irritating to severely disruptive (otherwise known as workplace bullying). What are the symptoms of abrasive leadership? Boss Whispering® is a coaching method designed specifically for abrasive leaders, who are generally unaware of, or tend to minimize the impact of their behavior. Based on extensive research with over 400 abrasive executives, managers, supervisors and professionals (including medical, legal, and academic), this approach helps individuals quickly gain insight into the impact of their words and actions and develop non-destructive management strategies. This highly confidential process involves an initial onsite assessment followed by regular in-person or telephonic coaching sessions. Boss Whispering® usually lasts 8-10 sessions, and demonstrable results should be evident by the third coaching session. What are the advantages of Boss Whispering®? Boss Whispering® is designed to be enlightening and profoundly rewarding for the abrasive leader. Coaching clients frequently express gratitude for their employer's willingness to offer help through Boss Whispering®, rather than moving toward demotion or termination. Coworker distress ends, and employees regard the leader positively for changing, and the organization for intervening. Finally, employers retain the leader's expertise while eliminating the risk of future attrition, litigation, or anti-organization sentiment related to abrasive leadership. 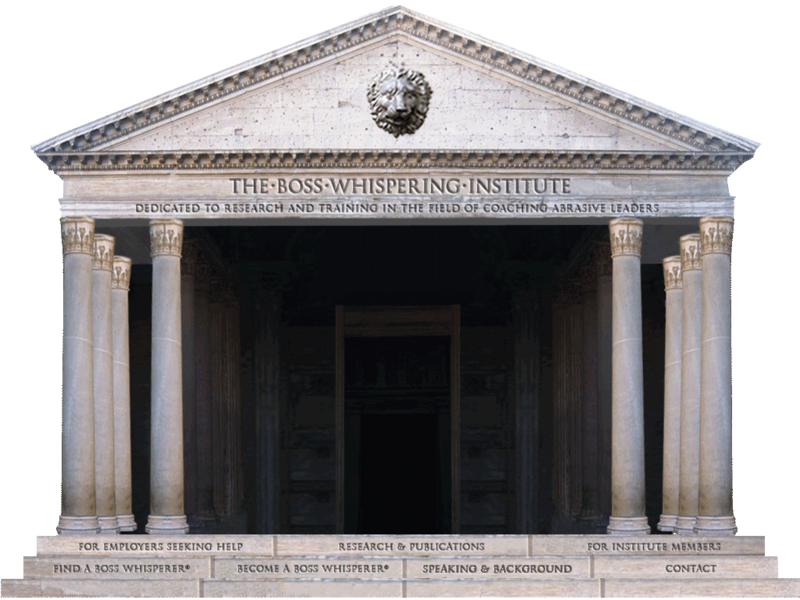 © 2009-2016 THE BOSS WHISPERING INSTITUTE. ALL RIGHTS RESERVED.